For over a decade I have had the pleasure of spending time with enthusiastic artists who want to improve their painting. I have thoroughly enjoyed helping them along their own artistic pathways. During that time I have noticed two concerns that pop up over and over again. The second is that many feel that there is one (only one) correct way to do this. It is not difficult to see how the second line of thought could seriously hamper the first! Coming from a scientific botanical background via botanical illustration I have experienced one route by which such thoughts could arise; I am sure there are many more! I have met landscape painters who feel they are somehow inferior for not painting en plein air, flower painters who feel somehow inferior for not getting the flower shape ‘just right’, and painters of all subjects who feel they are cheating by working from photographs. Agapanthus: In the book I explain how this photograph inspired a floral abstract. I wanted to write a book that would help budding artists address these issues. A book seemed a good format for sharing my thoughts. A reader has time to read, ponder, and absorb information at their own rate, assimilating ideas which are useful to them and ignoring or rejecting those which do not suit. I had already begun working on it when Crowood contacted me to ask If I would write a book about painting flowers. It is no secret that I absolutely love flowers, and that I absolutely love painting them. Of course I wanted to do it! But what of the book I had started? I presented my idea to Crowood, suggesting that my original idea could be assimilated into a book on painting flowers. I was delighted when they agreed! ‘Painting Flowers, A Creative Approach’ is undoubtedly a book about painting flowers. I have shared my passion for painting flowers, and as many practical tips and painterly techniques as I could fit on the pages in the hope you will find them useful in your own painting. Many of theses techniques can be easily applied to other subject matter, and even other media. 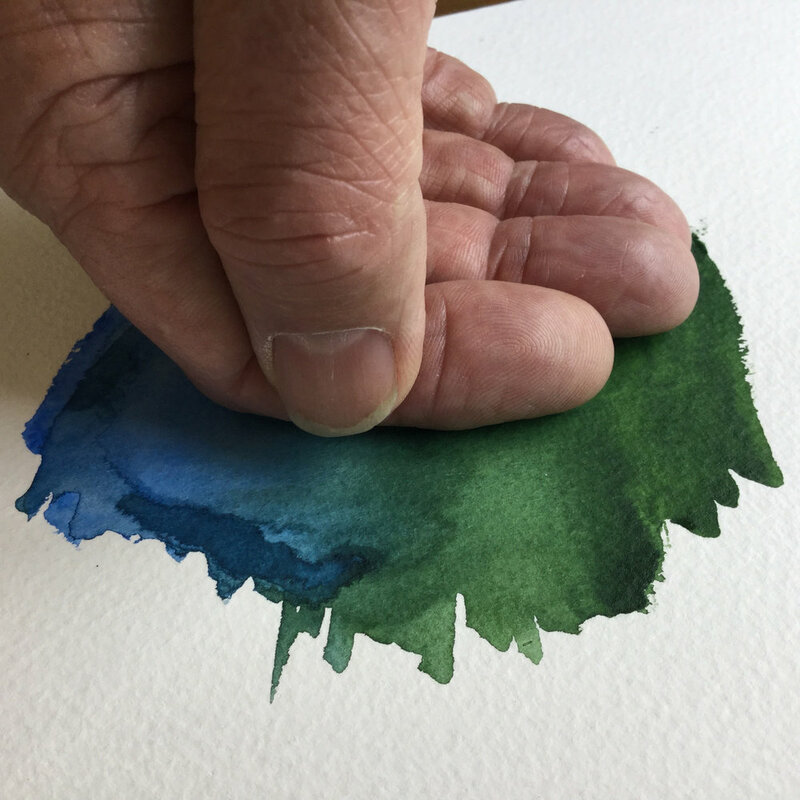 Learn how to mix paint so that you never run out of a colour. A tip for testing how dry your paper is before continuing to paint ; excellent for avoiding cauliflowers or for successful glazing . 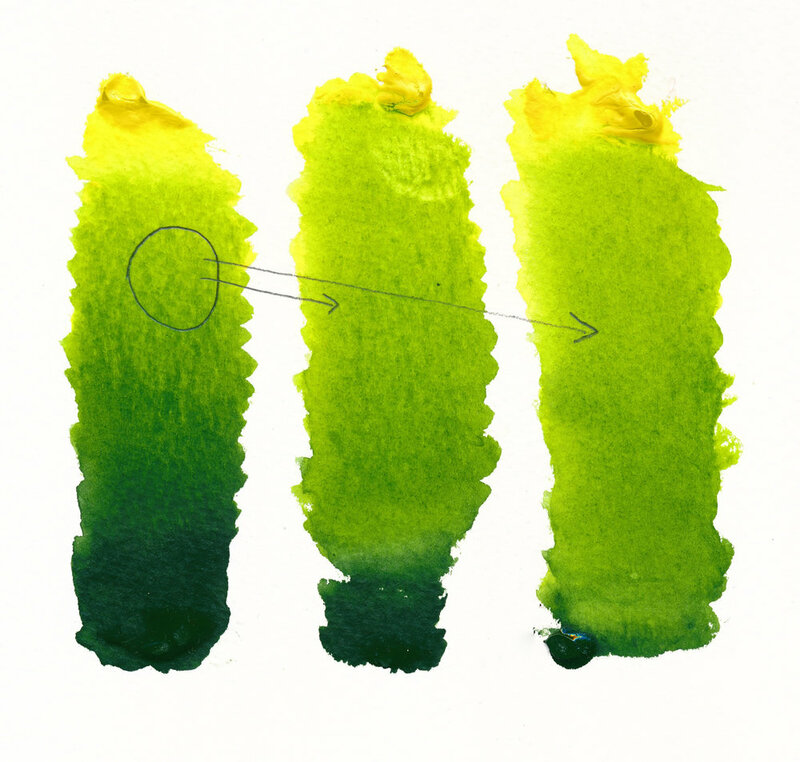 Step-by-step demonstrations teach techniques as the painting develops. this techniques features in 'Bluebell', seen right. 'Bluebell'. one of the step-by-step demonstrations. Click to see a larger image. I hope this book will help its readers to find confidence in their own creative ability, and to enjoy an artistic journey of experimentation and discovery. My style changes with my mood and the subject matter : take a look at these two paintings of hydrangeas. Both feature in the book. 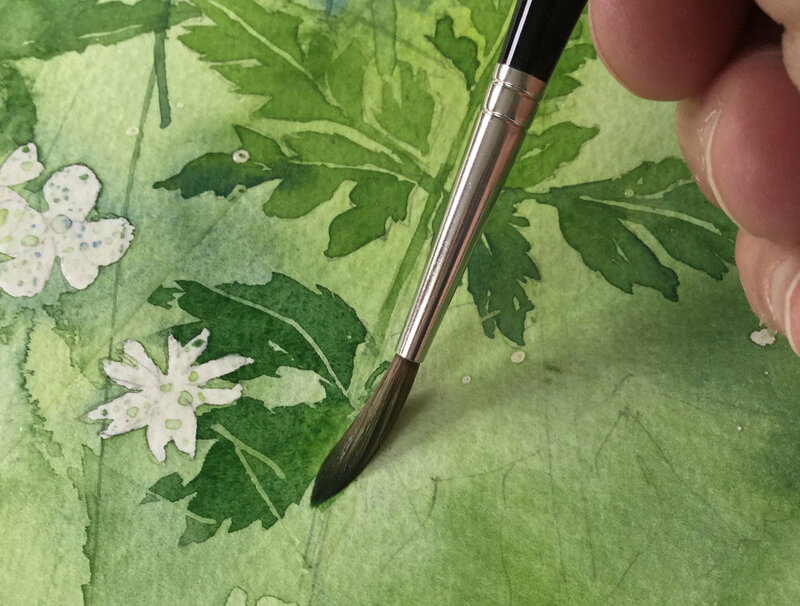 The close-up of the single floret is one of the step-by-step demonstration paintings in Chapter 7. the method used to produce the other painting is described in a step-by-step in Chapter 9. Signed copies may be purchased from this site. You will have the opportunity during checkout to request a personalised message. Painting Flowers, A Creative Approach is also available through Amazon and other major book sellers. These copies will not be signed. Please note that we do not currently ship books to countries outside the UK. Our books are available through Amazon.com in many countries, including the USA and Australia. • Demonstrations, exercises, studio tips and projects guide the way, but the book’s emphasis is on developing your own ideas and styles through creative experimentation. Siân Dudley paints vibrant and exciting watercolours of flowers. She is also a passionate and experienced teacher, and internationally known as an online contributor to Art Tutor. She lives in Devon and runs Moor to Sea Arts with her husband Rob Dudley.